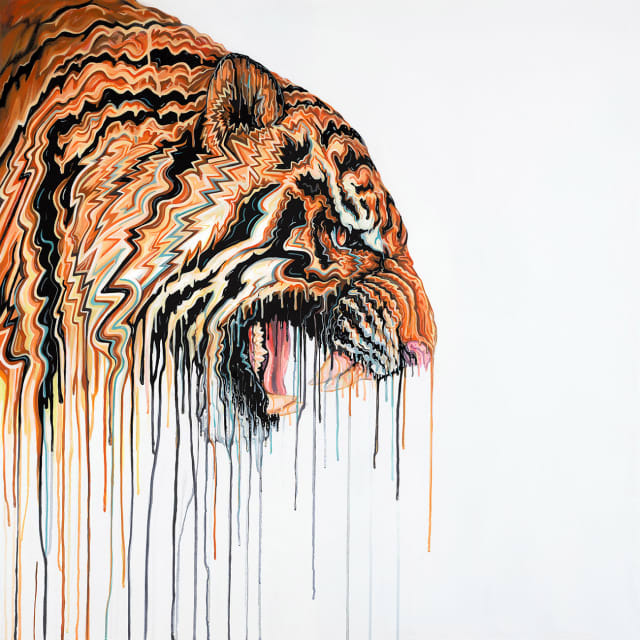 Robert Oxley has given natural history art a shot in the arm with his bold and unique painting style. After working in natural history painting for twenty years, Oxley decided he needed to find his own singular voice to stand out from the crowd in the field. Oxley came up with a hugely popular, surreal style that has resonated with buyers around the world. Dark, edgy, yet playful, Robert Oxley’s animal paintings have breathed new life into wildlife artwork. Browse our gallery of Robert Oxley paintings to buy limited edition, signed prints. Now based in Stockport, Greater Manchester, Robert Oxley started painting at a very early age. Oxley always had a passion for wildlife. When he was very young he wanted to be a zoo keeper, and he would draw pictures of imaginary zoos. At the age of 12 his grandfather challenged him to draw all of the species from a book of birds both of them used to read. Oxley succeeded, and his grandfather exhibited the drawings at his place of work. As he grew up, Robert Oxley was influenced by horror movies and rock music, and he began to work these influences into his art. Though he dabbled in conventional art scholarship in his youth, Oxley decided A Levels and degrees were not for him. Instead he taught himself everything he knows about painting from scratch. This new style fuses photorealism with abstract surrealism and expressionism. Oxley sees it as a “deconstruction” of the work he had been doing for most of his career, distorting images that he would previously have kept realistic and tame. Oxley uses acrylic on canvas, making carefully controlled brush strokes that somehow coalesce into a wild and loose image. The paintings appear free and uncontrolled, and yet really they are meticulously constructed. This, after all, is what nature is all about. Since making this change, Robert Oxley’s art has been exhibited throughout the UK, appeared in many publications, and he was highly commended for the BBC’s wildlife artist of the year.